Publisher: Hamlyn, London, 1970, hardcover 8vo with dj, 3 stories, 510 pp. red coloured endpapers, red page tops. Description: From the AGATHA CHRISTIE CRIME COLLECTION SET Three Books in One: Cat Among the Pigeons ; The Labour of Hercules Hickory Dickory Dock We have many books by Agatha Christie on this website, and yes we combine shipments so you will save ! Publisher: Hamlyn, London, 1970, hardcover 8vo with dj, 3 stories, 511 pp. red coloured endpapers, red page tops. Description: From the AGATHA CHRISTIE CRIME COLLECTION SET Three Books in One Murder is Easy Dead Man's Folly The Man in the Brown Suit We have many more books by Agatha Christie on this website and yes, we combine shipments so you will save !. Description: From the AGATHA CHRISTIE CRIME COLLECTION SET Three Books in One The Pale Horse The Big Four The Secret Adversary We have many more books by Agatha Christie on this website and we combine postage so you will save ! Publisher: Hamlyn, London, 1970, hardcover 8vo with dj, 3 stories, 508 pp. red coloured endpapers, red page tops. Publisher: Hamlyn, London, 1969, hardcover 8vo with dj, 3 stories, 507 pp. red coloured endpapers, red page tops. Publisher: Hamlyn, London, 1970, hardcover 8vo with dj, 3 stories, 544 pp. red coloured endpapers, red page tops. Condition:Crisp black cloth-bound hardcover with bright gilt title to spine and bright gilt flourishes to cover including bright gilt/red "AC Crime Collection" motif , STRAIGHT, TIGHT and CLEAN in VERY GOOD CONDITION with no inscriptions, in unclipped GOOD PLUS DJ. Publisher: Hamlyn, London, 1969, hardcover 8vo with dj, 3 stories, 511 pp. red coloured endpapers, red page tops. Description: Three Books in One in the classic "CRIME COLLECTION" format with a quality binding ...1. Murder on the Orient Express 2. Death in the Clouds 3. Why Didn't They Ask Evans ? 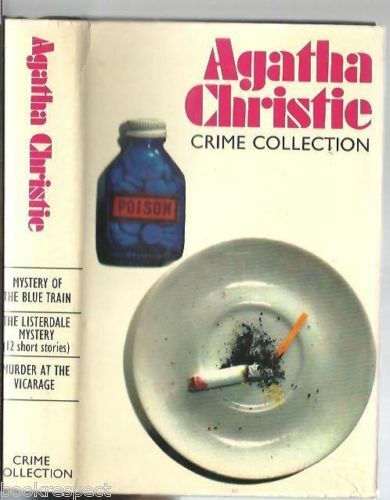 all by Agatha Christie WE HAVE MANY VOLUMES of the "CRIME COLLECTION"
Author: Agatha Christie, respected author of the HERCULE POIROT and Miss MARPLE mystery stories.